Wiseman Alaska is currently a very small community, without any services, restaurants or stores, etc. It has a rich gold mining history and was a popular town in the early 1900s. It is located about 260 miles North of Fairbanks, above the Arctic Circle and is a popular destination to view the northern lights. next » | 204 sample images from this category. Try a keyword search to see them all. Aerial of the historic mining community of Wiseman, Alaska. Wiseman Trading Post, Wiseman, Alaska. Interior of the Wiseman trading post store, Brooks Range, Wiseman, Alaska. Man views the northern lights from a log cabin in Wiseman, Alaska. Northern lights and a log cabin in Wiseman, Alaska. Log cabin in historic community of Wiseman, Alaska. Julia and Leo Hicker, Wiseman, Alaska. Walking along a path by log cabin in Wiseman, Alaska, Arctic. Aurora borealis over the Brooks Range mountains near Wiseman, Alaska. Rocking chair on front porch of old cabin in Wiseman, Alaska. Rustic log cabin in the woods, Wiseman, Alaska. Log cabin porch in the historic community of Wiseman, Alaska. Log cabin in winter, Wiseman, Arctic, Alaska. Koyukuk River, Brooks Range, Arctic, Alaska. Pink sunset over the Koyukuk River, Brooks Range near Wiseman, Alaska. Snow on the branches of white spruce trees, Wiseman, Alaska. Wiseman trading post, James Dalton Highway, Brooks Range, Wiseman, Alaska. 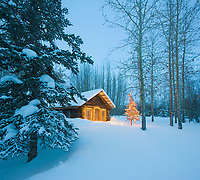 Historic general store log cabin in winter, Wiseman, Arctic, Alaska. Wiseman Alaska, situated at the base of the Brooks Range, Arctic, Alaska. Old cabin porch in the old mining community of Wiseman, Alaska.